A fixed mindset in students and teachers can affect student’s achievements in Mathematics. 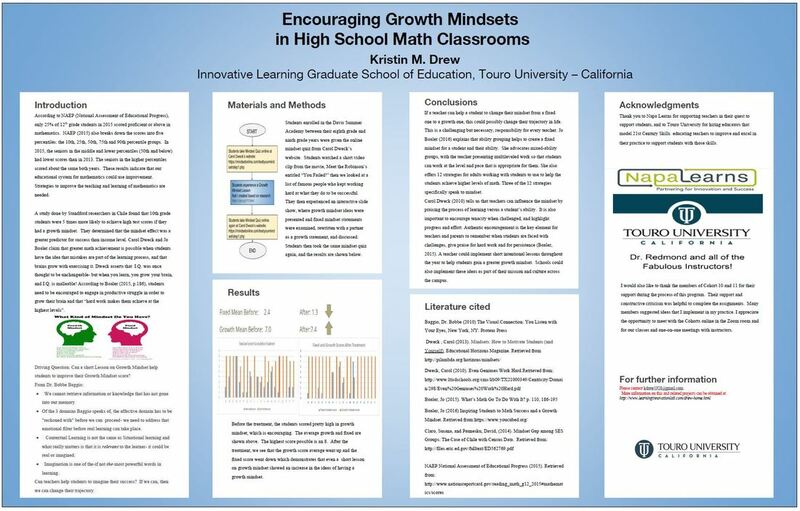 Can educators influence a change in mindset in students in a high school math classroom and then observe more positive results in mathematics achievement? Carol Dweck, (2006), has shown with her research that, “mindsets are things that people can learn”. Adults can influence this mindset. The study will assess whether a single lesson on Growth Mindset can influence students thinking about their learning process. The researcher/teacher used Dweck’s and Jo Boaler’s techniques to encourage a different mindset during a Summer Academy lesson. The results showed an increase in the growth mindset score as well as a decrease in the fixed mindset score. To view an overview of the research paper with a Google Presentation, 7 slides, click here.